The pharmaceutical industry likes to outsource. And that fact is blatantly obvious when one considers the outsourcing activity within the formulation development and manufacturing sector. According to a 2013 report from Frost & Sullivan, on a global scale, pharma spent $13.43 billion on contract manufacturing services. That number is expected to reach $18.49 billion by 2017. The Frost & Sullivan report indicates that injectable dose formulations will likely be the primary growth driver for outsourcing through 2017, primarily due to an increased pharmaceutical and biotechnological focus on complex disease areas. However, in 2012, solid-dose formulations were the largest segment, constituting 49.8% of the total pharmaceutical contract manufacturing market, and is projected to grow at a CAGR of 3.4% through 2017. Generics are the key driver for growth in this segment. Liquid and semi-solid dose formulations are considered a mature market and its CAGR is expected to be only around 2.5% from 2012 to 2017. This is due to a decreasing demand for such formulations, primarily attributed to associated transportation, storage, and packaging issues. Because of pharma’s increased outsourcing practices, contract formulation and manufacturing providers are striving to provide a greater value proposition for clients by engaging earlier in projects and establishing longer-term relationships. According to Frost & Sullivan, many are focusing on pre-clinical development services and can transition from offering clinical services to commercial manufacturing to integrate throughout the value chain of clients. Drug Development & Delivery recently asked leading CMOs and CDMOs to describe the value-added services they offer with respect to formulation and manufacturing. Solving challenges of insufficient solubility, poor stability, identifying excipient candidates, and particle design topped their list of offerings. AAIPharma Services Corp. and Cambridge Major Laboratories, Inc. recently joined to form a comprehensive pharmaceutical development and manufacturing services supplier. 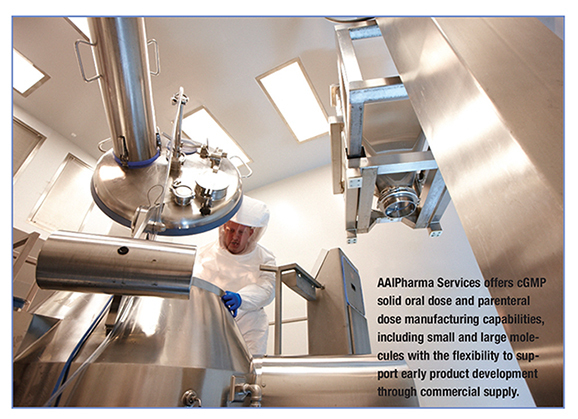 With nearly 800 employees operating out of 7 sites in the U.S. and Europe, the combined capabilities include API development and manufacturing, solid-state chemistry, formulation development, analytical development and testing services, clinical and commercial finished dosage form manufacturing (solid dose and parenteral), packaging, and stability services. In January of 2014, AAIPharma Services Corp. completed a multi-million dollar expansion of its cGMP parenteral manufacturing facility in Charleston, SC. The expansion doubled the facility’s sterile product development and production capacity and added state-of-the-art redundancies to major processing equipment. New facility features include low line loss and in-line weight check capabilities. In addition, the buildout was engineered to accommodate a pilot and production-scale SP Hull lyophilizer, which will more than triple the facility’s lyophilization capacity by late 2014, and afford seamless lyophilization cycle optimization and scale-up, explains Dr. Maffuid. In 2013, AAIPharma Services added a multi-layer tablet press, the Korsch XL 400 MFP, with a flexible design platform that permits production of all tablet formats (single-layer, bi-layer, tri-layer and corecoating) on a single tablet press. In another early-phase challenge, a client requested three strengths of immediate-release capsules for a blinded study using a drug development candidate with extremely poor solubility across the desired pH range, and poor wettability that resulted in processability and uniformity issues with the existing manufacturing method. AAIPharma addressed the wettability issue by incorporating a GRAS surfactant into the dry blend process, resulting in an improved dissolution rate to the target amount and ensured that the target immediate-release profile was achieved. Dr. Maffuid goes on to explain how AAIPharma has successfully leveraged technology for dosage form development and for extending patent life on existing branded products. In this scenario, AAIPharma investigated the feasibility of formulating a highly flexible drug delivery system using mini-tablets in hard gelatin capsules to deliver one or more drugs in a variety of release profiles. The feasibility of delivering a drug or multiple drug combinations in a biphasic immediate/extended-release manner was demonstrated by combining mini-tablets of various release profiles in a hard gelatin capsule. In the end, the team demonstrated that a pulsatile-release pattern is feasible with the combination of immediate-, delayed-, and extended-release mini-tablets. Based on these various scenarios, Dr. Maffuid is convinced that outsourcing formulation development and manufacturing will continue to increase, driven by the overall trend to offset fixed costs and capital expenditure, with faster-than-market growth expected in biopharmaceutical manufacturing, biosimilars, targeted therapies, high potency drugs, and injectable dosage forms. Agere is a CDMO specializing in solubilization formulation through amorphous solid dispersions to enhance oral bioavailability. The company offers solubilization formulation services through Phase II clinical trials materials manufacturing. Agere’s global client base ranges from virtual and small-size companies to mid-size and Top-20 pharmaceutical firms. All services are offered on a fee-for-service basis. 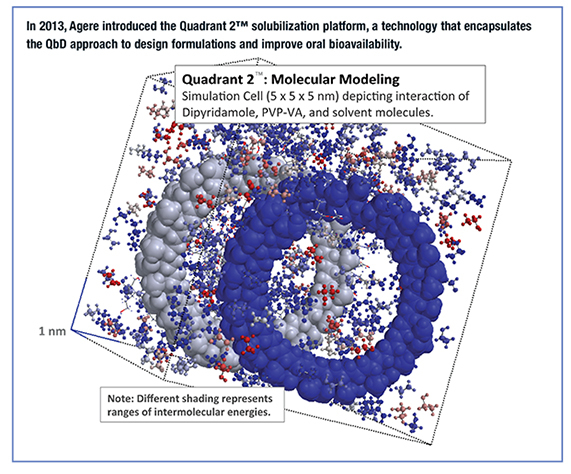 In 2013, Agere introduced the Quadrant 2(TM) solubilization platform, a technology that encapsulates QbD principles and is guided by the client’s API and QTPP (Quality Target Product Profile) to design formulations that not only improve oral bioavailability, but also meet the overall goals for the drug product. Avomeen Analytical Services is a comprehensive pharmaceutical development laboratory (CRO) that serves clients through all stages of the drug development process including clinical trial material manufacturing. 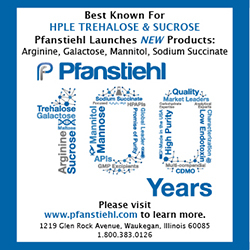 Our primary capabilities include preformulation & formulation, method development & validation, chemical characterization, extractables & leachables testing, clinical trial material manufacturing, food contact notifications, defect & unknown material identification, counterfeit analysis, and stability & release testing. Shri Thanedar, PhD, CEO at Avomeen Analytical Services, says his company is “big enough to maintain the resources that pharmaceutical developers and manufacturers need, but still small enough to be fully committed to our clients.” Avomeen’s state-of-the-art 25,000-sq-ft facility is located in Ann Arbor, MI. This location is ideal for the laboratory due to its close proximity to the University of Michigan and other prestigious universities which help connect the growing laboratory to other drug development and analytical experts in the area. These networking opportunities have helped facilitate the continuous growth in the knowledge and skill level of Avomeen’s staff. With over 50% of its staff being Masters, PhD, or above, Shri says that Avomeen “prides itself at being able to successfully solve the tough challenges that can arise in the drug development process within tight project deadlines”. The analytical facility also contains 4 ISO-7 Compliant clean rooms. Andrew Kolbert, PhD, MTM, Vice President of Technical Services at Avomeen says that he has seen “an expansion of single dose injectables, transdermal patches, buccal delivery, and inhalation delivery systems for active ingredients, some of which were previously formulated for oral delivery.” Changing the route of administration has challenges as well as opportunities. The opportunity is that the avoidance of the gastrointenstinal system as well as first pass metabolism by the liver can dramatically increase the bioavailability of an active pharmaceutical compound. The challenge is that bypassing the GI system allows all impurities, including any leachables to have very effective absorption into the blood. This increases the risk profile of the product and requires more extensive extractable & leachable testing as well as impurity and degradant profiling. Of course these products will be registered under NDAs rather than ANDAs and will require clinical trials. A further mega-trend in this industry is patent expiry. We have seen numerous generic pharmaceutical companies working to develop generic versions of products that will soon go off patent. It used to be that one could put together a formulation, demonstrate bioequivalence, and be good to go. That is no longer the case. The FDA is now requiring generic manufacturers to formulate with the same excipient profile, but of course they cannot tell you what it is you are aiming to achieve, as that information is confidential. This requires the generic company to deformulate the innovator’s product. Avomeen has depth and breadth in deformulation services, but due to changes in regulatory oversight, is now seeing much more pharmaceutical deformulation work. We have become experts in isolation, separation, and quantitation of a wide variety of pharmaceutical excipients allowing us to deformulate a pharmaceutical product to Q1/Q2 requirements (± 5 relative % on all ingredients). Further, Avomeen is currently expanding its traditional service offerings of analytical testing and pharmaceutical investigations to also include clinical trial material manufacturing to better serve its clients. This now allows Avomeen to be able to develop phase I-IIa drug products in a variety of dosage forms. Also expanded upon throughout the last year was Avomeen’s litigation support division. Shri Thanedar, PhD, CEO of Avomeen says that many of the laboratories that are similar to his own in this marketplace avoid this area of work, but that his confidence in his analytical team to be able to solve highly complex legal issues in the pharmaceutical industry including those involving patent infringement, counterfeit drugs, and product contamination has pushed him to make expansions into this area of service. As there is a high cost of switching service providers due to technology transfer, pharma expects one-stop shopping from preformulation and formulation to methods development, validation, stability services, and supply of clinical materials. If a CRO cannot formulate, it becomes a much harder argument to bring them the analytical work as the formulators will also have to bring the analytical methods in house. If a CRO cannot manufacture clinical supplies, considering the cost of technology transfer, why bring them the formulation work? There are a number of trends that shape our industry. -A trend towards the bulk of the pharmaceuticals for all common conditions and illnesses being available as generics. There are opportunities in deformulation as well as alternative formulations for innovators that may delay the onset of generic competition. -A trend towards innovation in drug delivery and alternative routes of administration to make existing pharmacology more effective. These are opportunities for CROs which can exhibit creativity and be on the cutting edge of drug delivery technology. -Increasing focus on core competencies, which for big pharma is discovery, marketing, and sales. It isn’t formulation and analytical development, despite their enormous investment in it, and it certainly isn’t manufacturing. Some of this work ends up being off-shored, but much of it stays domestic as well. It makes little sense to run a stability program half a world away and the hidden costs of communication and program management eat up any cost savings that may be available, while significantly increasing the risk of missing market launch timelines. -The rise of the virtual pharmaceutical company which has no laboratories, only some intellectual property, a bank of phones, and a checkbook. This model would not exist save for the rise of the pharmaceutical CRO and CMO during the same time frame of 1990’s-2000. It is now possible to outsource everything associated to drug development and manufacturing, leading one virtual company CEO, Dennis Steadman of Velcera to remark “If big pharma could do it all over again in the 21st century, they would not build laboratories”. This new trend though requires the expansion in the number of competent CRO’s that can take on this growing need. One of our generic pharmaceutical clients was finding it impossible to prepare a stable generic injectable emulsion, despite an apparent understanding of all the components, amounts, and detailed mixing instructions. Avomeen explored a designed experiment around the mixing and production of the emulsion using advanced microfluidics technology prepared the emulsion and demonstrated its stability allowing the client to go to market. Capsugel is a global leader in delivering high-quality, innovative dosage forms, and solutions to its customers in the healthcare industry. The company sells nearly 60% of the world’s hard capsules, with a broad portfolio of gelatin, vegetarian, and other specialized capsule technologies. Capsugel’s Dosage Form Solutions (DFS) business unit was formed in 2013 with the addition of Bend Research (acquired in October 2013); Encap Drug Delivery (acquired in March 2013); and Capsugel’s pre-existing research and manufacturing operations. Now combined under a single banner, Capsugel’s DFS is a leader in drug delivery technologies and formulation development. Formulation offerings include technologies for oral bioavailability enhancement, modified release, taste-masking, and other specialized areas including pulmonary drug delivery, abuse deterrence, and biotherapeutic formulation and production. Capsugel’s DFS provides clients with a science-based approach to select the optimum solution to bioavailability enhancement based on molecular properties and target product profiles, as well as customer preferences. Growth areas for Capsugel’s DFS include development and manufacture of formulations for inhalation, and formulation and manufacturing support for biotherapeutic molecules. Based on the company’s formulation experience, Mr. Lorenz says a key trend in the pharmaceutical industry is the advancement of increasing numbers of compounds with low solubility. It is estimated that more than half of all new chemical entities have poor bioavailability because of low solubility. Capsugel’s DFS offers technologies that enable the delivery of low-bioavailability compounds, including amorphous formulations prepared by spray drying and hot-melt extrusion, nanocrystalline formulations, and lipid-based/self-emulsifying formulations. As this example illustrates, Capsugel’s DFS establishes a long-term, alliance-based relationship as a development-team partner. “This close relationship with our clients enables optimal scientific interaction, provides for efficient communication, and facilitates rapid progression toward program goals. Our clients tell us that our broad, full-service capabilities make us the ideal development partner,” says Mr. Lorenz. Gateway Analytical is a multi-faceted analytical testing laboratory focusing on niche areas of pharmaceutical testing and investigations. Its client base spans the entire gamut of the pharmaceutical drug market from development to manufacturing. Its chemically specific particle sizing services have been focused on supporting the generic drug industry by providing detailed analysis to help developers establish bioavailability and prove bioequivalence, with Raman Chemical Imaging, which has proven to be a game changer when dealing with identifying the chemical makeup agglomerates, aggregates, and polymorphs, explains David Exline, Vice President of Gateway Analytical. Over the past year, Gateway Analytical has offered new services in the areas of glass delamination testing, automated particle identification with combined Raman/LIBS analysis to characterize overall populations of foreign particulate, and expanded services in the area of chemically specific particle sizing. Within its chemically specific particle sizing group, Gateway has seen growth in the need to size and characterize agglomerations in drug products as this issue has significant impact on the drug quality and provides significantly more information about a product compared to conventional particle sizing methods. One example would be the application of chemically specific particle sizing to a generic formulation compared to an innovator product. “A client can utilize this method to address the FDA critical path opportunity for generic nasal suspensions formulations by providing the accurate and precise drug particle size measurement to demonstrate bioequivalence and save a considerable amount of time and money by being able to potentially wave the in vivo biostudies,” he describes. MBS provides monoclonal and polyclonal antibody services, from design and development to production, characterization, and assay development. MBS works with both pharmaceutical and diagnostic companies to develop antibodies against their targets of interest, which may include small molecules, recombinant antigens, peptides, and anti-idiotypes. Tools such as MultiPure technology and Octet Red kinetic analysis are used to allow customers the opportunity to refine their clone selection earlier in the process. The antibodies developed by MBS are used by customers to support therapeutic product release and clinical trials, as well as within their 510K-approved diagnostic kits. The most common end applications for anti-id antibodies developed at MBS are in the space of preclinical research for therapeutic antibodies. They can be used as reagents in pharmacokinetic studies, immune response immunogenicity assays, in ligand binding or neutralizing studies, or in antibody blocking assays. Metrics Inc. provides solid oral dose pharmaceutical development and manufacturing services to pharmaceutical industry clients worldwide. 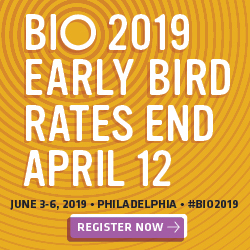 Areas of expertise include formulation development, first-time-in-man formulations, and clinical trial materials manufacturing for Phase I, II, and III trials leading to commercial-scale manufacturing, and analytical method development and validation services. Formulation development services include handling insoluble and unstable actives, potent and toxic actives, and small molecule delivery. Instant-release and controlled-release tableting, capsule filling, overencapsulation, milling, micronizing, and enteric coating are also offered. The CDMO is finding that the formulation development market has been faced with an increasing proportion of drug substances that are BCS II (Biopharmaceutics Classification System, category II) that need enhanced bioavailability techniques. 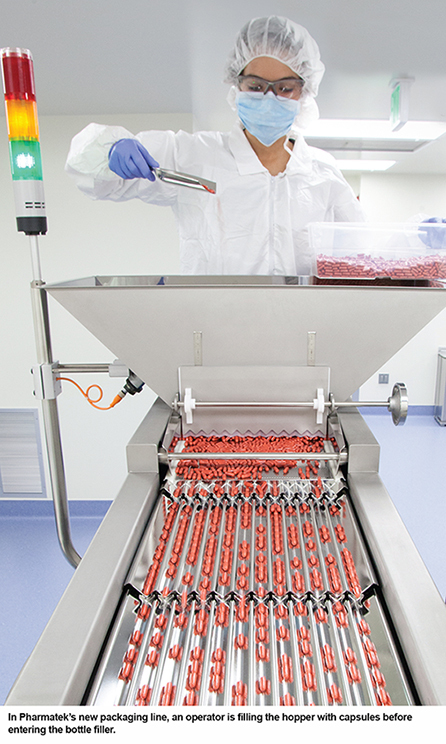 These techniques run the gamut from IP-based spray drying and new excipients to requests to use common practice equipment, including milling, sieving, and the addition of polymeric materials, explains Jeff Basham, Vice President of Business Development at Metrics. Drug substance salt or polymorph manipulations also can be used to help this process. Metrics Inc. has begun offering a novel drug delivery technology called SUBA® (Super Bioavailability) that involves co-processing of the poorly water-soluble API with a cellulosic enteric polymer. Co-processing is the means by which the particle size is reduced and further re-crystallization of the active ingredient is hindered by the presence of the enteric cellulosic polymer. The smaller particle size of the water-insoluble API allows for a higher level of bioavailability in the small intestine. When applied successfully, SUBA can deliver therapeutic and convenience benefits that include reduced dosing frequency, increased patient compliance, improved side effect profile, and a more constant therapeutic effect. Mr. Basham explains that SUBA was successfully used in the reformulation of itraconazole, an anti-fungal drug that has been available on the market in 100-mg dosage form. At that dosage form, itraconazole had been known to cause several side effects that are not beneficial to patient compliance. By employing SUBA technology, itraconazole has been reformulated such that patients are exposed to just half the amount of itraconazole per dosage form as before, he says. While the company’s predominant focus is in developing and manufacturing solid oral dose, tablets, and capsules, Norwich also provides liquid dose services. Unit operations range from blending, encapsulation and coating to fluid bed, blister packing, and liquid fill packaging. According to Ms. Ferrell, customers are looking for service providers that will be long-term partners. “The opportunity to work with a provider starting in early Phase I through commercial manufacturing gives customers a continuity of service while saving them time and money from having to move their project to other facilities for different phases. Thus, service providers need to be able to offer a wide breadth of services while having the flexibility and scalability to make sure that customer needs are met,” she says. 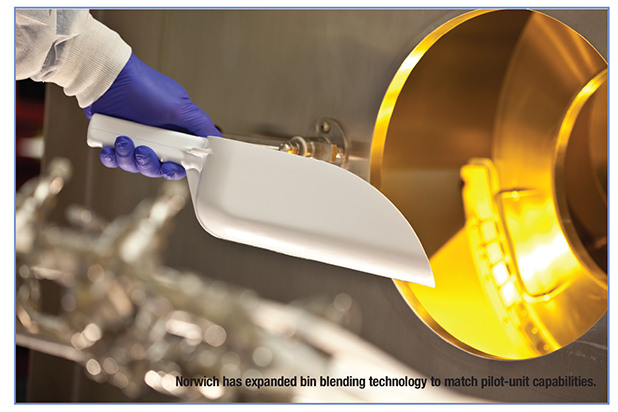 On the commercial manufacturing side, Norwich has expanded its blending technology options by adding bin blending to match pilot-unit capabilities. “Many newer products are being processed using bin blenders because they offer the potential for better uniformity and to overcome obstacles in product robustness,” explains Ms. Ferrell. Norwich strives to offer flexibility with new technologies while maintaining legacy v-blending capabilities for customers not interested in moving their products to a new technology. Additionally, low humidity capabilities have been expanded to handle products down to a 30% humidity environment, and packaging capabilities have been expanded to provide an increase in packaging speed from 25%-50%, depending on bottle size. Norwich’s depth of project management experience was highlighted when a customer presented a controlled-release tablet that required technical development and scale-up manufacturing, explains Ms. Ferrell. Key challenges for the drug formulation included temperature control, coating sensitivity, and clarity. In addition, the sensitive tablet coating process could impact the release profile of the drug through one or more laser-drilled holes. “Norwich immediately focused the project to design process parameters that control the quality of coating as well as its final clarity,” she says. The Norwich team learned how to operate and perfect the innovative laser drill process technology used for the complicated potent compound. Equipment installation was performed in a room designed to meet stringent Class 1 Division 1 standards and minimize potential risks to personnel and environment. 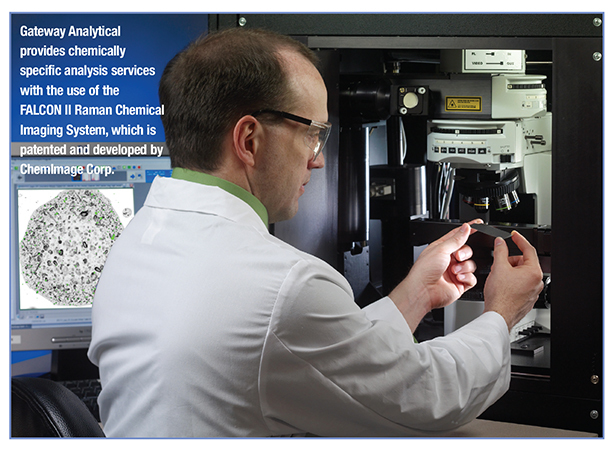 Particle Sciences, Inc. is an integrated provider of drug development services. Particle Sciences focuses on BCS II/III/IV molecules, biologics, and highly potent compounds through a variety of technologies, including emulsions, gels, micro- and nanoparticulates, drug/device combination products, and solid solutions. Through a full range of formulation, analytic, and manufacturing services, Particle Sciences provides pharmaceutical companies with a development solution that minimizes the time and risk between discovery and the clinic. In the past year, Particle Sciences increased its offerings around GMP nanomilling, hot-melt extrusion, and spray drying to address formulation of BCS II molecules, explains Robert. W. Lee, PhD, Vice President, Pharmaceutical Development Services, Particle Sciences, Inc. In the second quarter of this year, the company will be offering a proprietary pro-drug approach that drastically increases the solubility of BCS II molecules. This will offer an alternative to nanoparticles for parenteral delivery of insoluble compounds, claims Dr. Lee. Throughout the formulation process, Particle Sciences incorporates a Quality by Design (QBD) approach using modeling and Design of Experiments (DoE) to arrive at the best product with the strongest regulatory package. “One of our clients had a sterile emulsion that it wanted us to manufacture under GMPs using our M110EH Basic Biopharma Microfluidizer. At the requested scale of 120 L, the number of passes was prohibitive and by using a DoE approach, we were able to reduce the number of passes sufficiently to allow for an acceptable manufacturing process,” explains Dr. Lee. 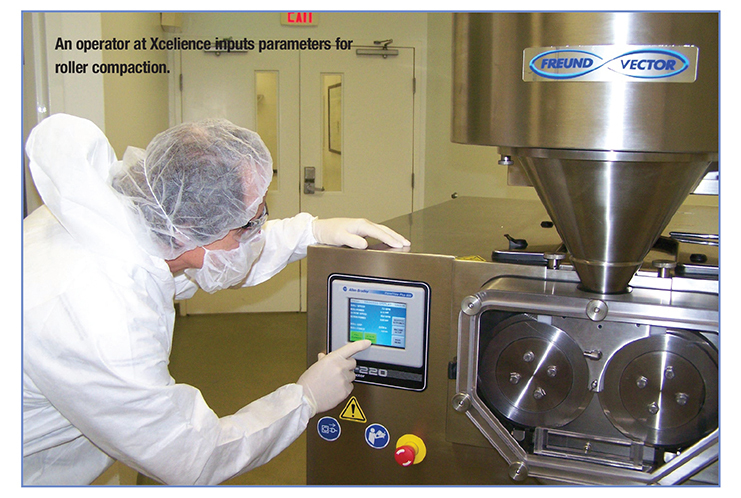 Patheon Inc. is the pharmaceutical services business owned by DPx Holdings. The company is a leading provider of CDMO services, pharmaceutical products, and products for other industries. With global headquarters in Durham, NC, DPx has a footprint of 24 locations across North America, Europe, Latin America, and Australia. Patheon provides preclinical, clinical formulation development (Phase I to III), scale up, and process development of solid oral and sterile dosage forms. In addition, Patheon provides registration batch manufacturing, process validation, QbD, and small- and large-scale commercial manufacturing. “We undertake formulation and process development of a variety of dosage forms – simple solid oral forms in early-stage clinical development and late-stage clinical development such as powders, granulates, capsules, tablets, softgels, sterile liquids, lyophilized powder in vials, and prefilled syringes,” describes Anil Kane, PhD, Executive Director, Global Formulation Sciences, PDS, Patheon. The dosage forms developed are immediate release as well as controlled release forms in a variety of technologies to meet the dosage profile for clinical therapeutic efficacy. Patheon also offers formulation development and manufacturing services in life cycle management for pediatric dosage forms, fixed-dose combinations as multi-layer tablets, multiparticulates, beads, minitablets, etc. He also points out a rising number of products being developed as line extensions or as part of a life cycle management strategy. “Development of modified release, controlled-release dosage forms, and active drug layering are on the rise,” he says. 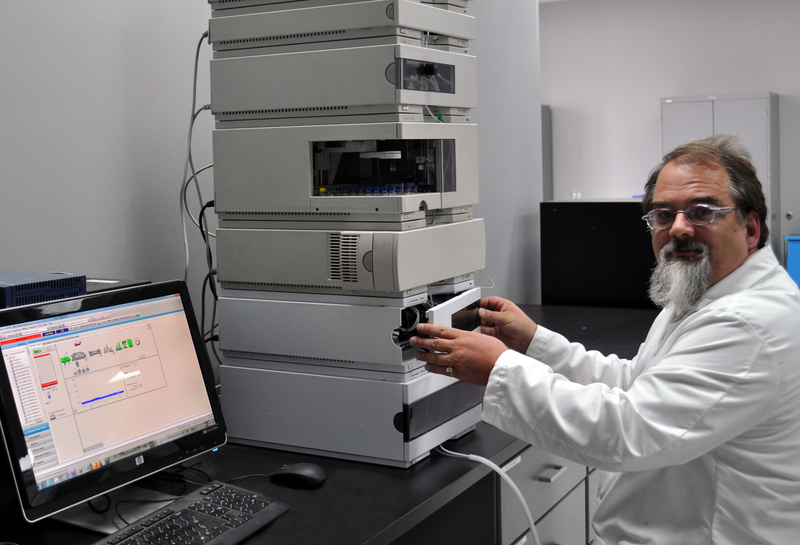 In the past year, Patheon launched the “Early Development” service in Cincinnati and at its Milton Park site near Oxford, UK, to address API characterization, formulation screening, clinical formulation manufacture, and stability studies. The company also launched development and commercial manufacturing services of softgels as standard softgels, and using its patented technologies to target the drug at various regions of the gastro-intestinal tract. Patheon has invested in Phase II scale manufacturing capabilities at the Milton Park site. In addition, Patheon is also investing in equipment and capability of handling high potent compounds at these early development centers. Through formulation development, Patheon has solved low-solubility problems and developed formulations with significantly higher exposure in animal model or first-in-man clinical studies. The increase in bioavailability was achieved using one or the other techniques from the tool kit – micronization, micro fluidization, lipid-based solubilization, or by solid dispersion techniques such as spray drying or hot-melt extrusion. Patheon has also addressed problems of poor flowability of active drug substance powders, and developed manufacturing and scalable processes that can support commercial large-scale manufacturing. In the area of sterile dosage forms, several projects have been successfully completed where a formulation was developed to stabilize the drug in a sterile solution and monitor the physical and chemical stability over a period of time. Pharmaek is a full-service dosage form development and GMP manufacturing services organization. Services include preformulation testing, analytical and formulation development, GMP manufacturing, clinical packaging, labeling and distribution, and stability testing and storage. With 15 years of experience developing small molecules and peptides for oral and injectable delivery, Pharmatek specializes in the development and manufacture of challenging compounds and complex formulations, including poorly soluble NCEs and controlled-release formulations. According to Elizabeth Hickman, Associate Director, Marketing, Pharmatek, the need for formulation and manufacturing technologies that address poor solubility continues to increase. 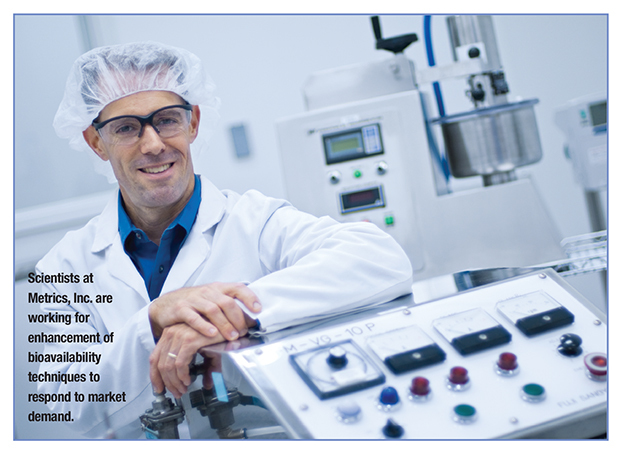 Pharmatek recently purchased an automated bottling and labeling line. The addition of the line is part of the company’s ongoing investment to support increasing demand for larger scale productions. “Automatic bottling improves the efficiency and accuracy of clinical packaging, resulting in a reduction in overall costs and time-to-clinic. Additionally, the new bottling line significantly increases Pharmatek’s overall capacity, allowing higher throughput and larger GMP manufacturing runs,” says Ms. Hickman. To complement its toolkit of solutions for poorly soluble compounds, Pharmatek recently invested in particle size reduction technology with the addition of a Jet-OMizer Jetmill for the micronization of API. The company also recently added a Niro Mobile Minor Spray Dryer. The new spray dryer will complement current spray drying capabilities and enable the production of larger batches for early-phase clinical trials. Pharmatek has seen a growth in the number of peptide compounds being developed in recent years. In the past year, the company has worked on seven peptides for early-phase development. Formulation strategies include suspensions, liquids, frozen liquids and lyophilized products. Each formulation strategy requires a thorough understanding of peptide chemistry and injectable development. Xcelience is a full-service CDMO that can manage the progression of a pre-IND API through the development process. A client’s API can be fully characterized (salt and polymorph screens, intrinsic solubility, etc.) before formulation development. Xcelience can develop a range of formulations, including capsules, tablets, oral solutions/suspensions, and topical products, using technologies such as roller compaction, extrusion/spheronization, wet granulation, and self-emulsifying systems for liquid products. The formulations are then moved into GMP manufacturing. According to Paul Skultety, PhD, Vice President, Pharmaceutical Development Services & Project Management at Xcelience, one of the biggest trends in formulation development is the incorporation of QbD principles in the development process. 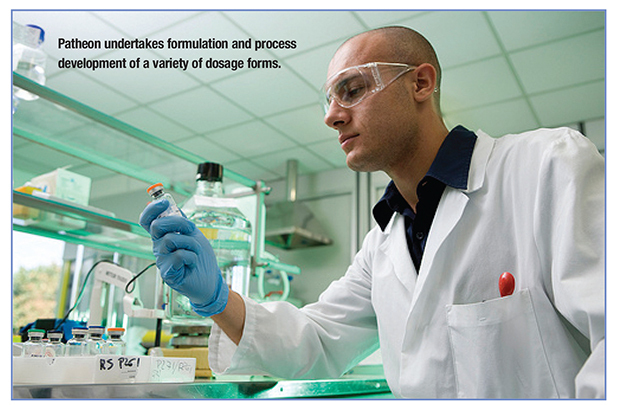 Formulation development must be performed such that critical quality attributes can be identified. This, in turn, will allow for critical process parameters to be evaluated and a risk assessment performed using tools such as Failure Modes and Effect Analysis to help determine which parameters might impact the process. The parameters that have an impact on the critical quality attributes can be evaluated using appropriate statistical study designs. “The data from these studies can be used to develop the design space (ranges for these parameters) for each critical process parameter,” describes Dr. Skultety. “By identifying and controlling these parameters, the product will have the desired quality characteristics. The design spaces will assist in determining in-process testing limits and the finished product specifications.” The data can further be applied to help justify the validation plan that will be used once the product moves to commercial scale.